“I prefer freehold” – this is probably the most common requirement which property buyers will have in their checklist when sourcing for a property in Singapore – whether it is for own use or investment. Based on historical land sales data from the Urban Redevelopment Authority (URA) of Singapore, there hasn’t been any freehold site being sold for the last 24 years. Thus, these days if you still see freehold new launch condo projects for sale, they are likely to be “recycled” freehold sites – or also known as enbloc sites. Comparing leasehold and freehold projects head-to-head, over the first couple of years from completion, there isn’t a clear winner when it comes to price gains. However things may not turn out to be in the favour of leasehold properties when the remainder of the lease gets lesser. In my opinion, if the property is purely for own use and not for the purpose of speculation, I’ll say it’s perfectly fine and a buyer may be able to find a couple of bargains in the property market. Personally, I feel that one of them is Neptune Court. Although it has a remaining lease of approximately 58 years, at an average $660 psf (for the last 6 months) and sizes of 1,270 to 1,636-sqft, you can probably find a good deal at below S$1 million. With the added convenience of having an MRT station near to the residential project in a couple of years’ time, it does seem like a very attractive option – especially for the East Coast lovers and parents who are planning to send their kids to Tao Nan Primary School in future. Now, here comes the challenge. There are a couple of reasons why such dated properties don’t command a premium pricing when compared to its newer neighbours. One of them being the fact that banks are generally reluctant to grant loans for properties which have less than 60% of the total tenure due to risk assessment. Financial institutions will worry about getting their money back if they ever need to repossess the property. Then again, they are generally on case-by-case basis and even if the loan is granted, it may be of a lower amount (i.e. loan-to-value ratio) and a shorter loan tenure. To make things even more difficult, the usage of CPF savings to finance the property is also very much restricted. You can download the full documentation from CPF here. One of the stipulation is that the subject property is required to have at least 30 years of lease remaining. And if the property has a lease remainder between 30 to 60 years, the total sum of the remaining lease and the buyer’s age must be a minimum of 80 years. There will also be a cap on the amount which buyers can utilise with the CPF savings for such properties. Thus, with the given problems in financing such homes, the pool of buyers will generally shrink and so will the demand. And without a strong demand, prices will likely stagnate or even decline over time. 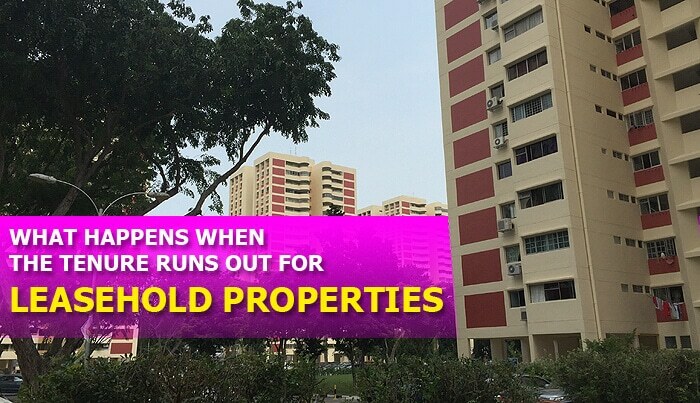 Another challenge to note is that when it comes to en bloc sales, existing leasehold properties will less likely attract developers due to the hefty cost involved – such as the land premium to top up the lease back to 99-year (which at times approval may not even be granted), which will eventually eat into the developer’s profit margin. Anyway here’s a video explaining what happens when the tenure runs out for a leasehold property in UK. I presume it will be the same for leasehold properties in Singapore as our legal system for real estate is rather similar. Well, it’s a good reference though. So given a choice, developers will rather acquire sites listed under the Government Land Sales (GLS) programme, which generally makes more business sense. But of course, there are exceptions. Such as the recent en bloc sale of Shunfu Ville and the pending collective sale of Raintree Gardens at Potong Pasir, which are able to offer developers opportunities to redevelop (typically the potential to build more residential units than the current) for greater profits.